Burton came from a goal behind to beat Chesterfield and extend their lead at the top of the League One table. The home side made the perfect start through a Sam Hird header from Dan Gardner's corner to give them the lead at the break. 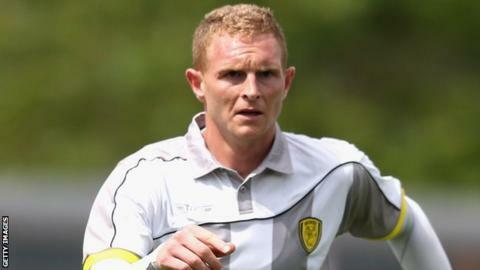 Burton hit back 30 seconds into the second-half when striker Stuart Beavon tapped in his fifth goal of the season. Substitute Jerome Binnom-Williams fired low past Spireites keeper Tommy Lee in injury time to take all three points. The Spireites looked to have earned a point with Breweres striker Beavon squandering a couple chances after his equaliser only for Binnom-Williams to send the away fans into raptures with his dramatic late winner. The result comes as back to back defeats for Dean Saunders' side who drop down to 15th in League One. "I thought we started sloppy. We spoke about it before the game that it was going to be one of those games that we had to start well. We didn't really do that well but then I must say after that 10 minute bad spell it was all about us. "If you speak to the neutral supporter they would say Burton deserved to win today. And they played attractive football." Match ends, Chesterfield 1, Burton Albion 2. Second Half ends, Chesterfield 1, Burton Albion 2. Jerome Binnom-Williams (Burton Albion) is shown the yellow card for excessive celebration. Goal! Chesterfield 1, Burton Albion 2. Jerome Binnom-Williams (Burton Albion) left footed shot from the left side of the box to the bottom right corner. Assisted by Abdenasser El Khayati following a fast break. Attempt blocked. Damien McCrory (Burton Albion) left footed shot from the centre of the box is blocked. Substitution, Burton Albion. Matthew Palmer replaces Lucas Akins. Attempt missed. Armand Gnanduillet (Chesterfield) header from the centre of the box is close, but misses to the right. Corner, Burton Albion. Conceded by Ian Evatt. Attempt blocked. Callum Butcher (Burton Albion) right footed shot from the right side of the six yard box is blocked. Attempt saved. Abdenasser El Khayati (Burton Albion) left footed shot from the left side of the box is saved in the bottom left corner. Substitution, Burton Albion. Jerome Binnom-Williams replaces Mark Duffy. Attempt saved. Armand Gnanduillet (Chesterfield) header from the left side of the six yard box is saved in the centre of the goal. Robbie Weir (Burton Albion) is shown the yellow card for hand ball. Hand ball by Robbie Weir (Burton Albion). Attempt blocked. Abdenasser El Khayati (Burton Albion) left footed shot from outside the box is blocked. Corner, Burton Albion. Conceded by Armand Gnanduillet. Corner, Burton Albion. Conceded by Drew Talbot. Attempt blocked. Lucas Akins (Burton Albion) left footed shot from the centre of the box is blocked. Attempt missed. Philip Edwards (Burton Albion) header from very close range is too high following a corner. Attempt missed. Armand Gnanduillet (Chesterfield) right footed shot from the right side of the box is high and wide to the right. Attempt missed. Robbie Weir (Burton Albion) right footed shot from more than 35 yards is too high. Substitution, Chesterfield. Armand Gnanduillet replaces Sylvain Ebanks-Blake because of an injury. Attempt saved. Sam Hird (Chesterfield) header from the centre of the box is saved in the bottom left corner. Delay in match (Burton Albion). Attempt missed. Mark Duffy (Burton Albion) right footed shot from outside the box is close, but misses to the right following a set piece situation.